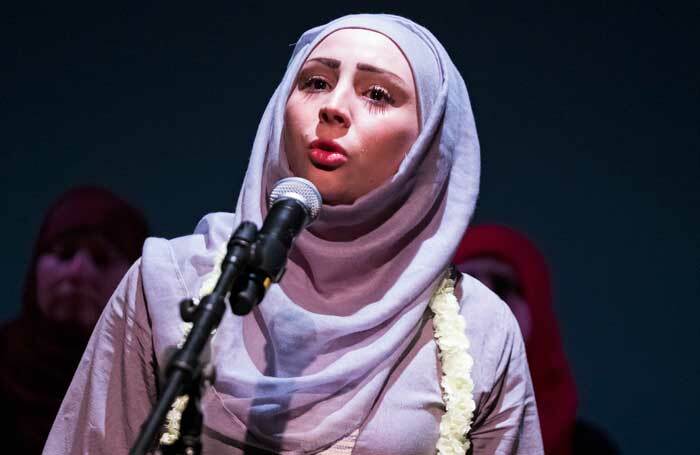 Opening on the day that Eid is celebrated, this show places 13 Syrian women on stage to share their experiences as refugees. They are the voiceless voiced. This is made clear from the opening moments when they clap their hands over their mouths then shout, in unison, lines from Euripides’ fierce tragedy The Trojan Women. 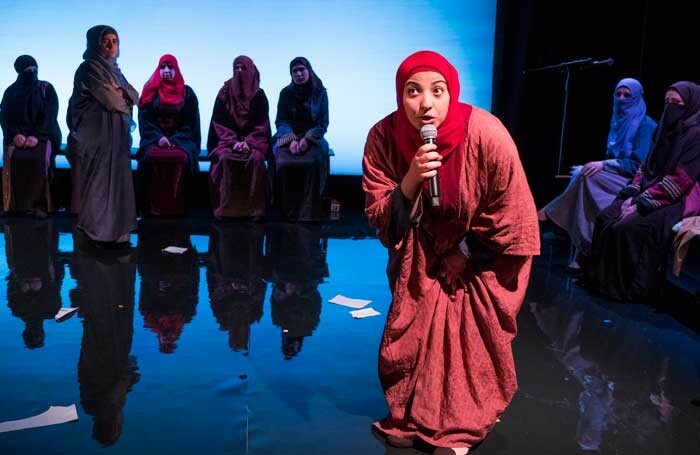 Queens of Syria, which is touring the UK this summer, began in Jordan in 2013 as a drama therapy session. 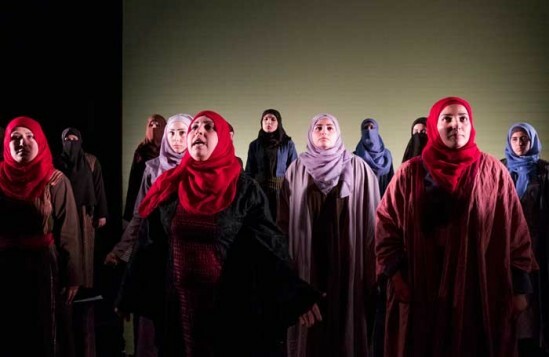 Almost 50 women took part in the original project, drawing parallels between their stories and the fierce anti-war sentiment of Euripides’s play The Trojan Women, in which the women who survived the Trojan War lament the loss of their land. 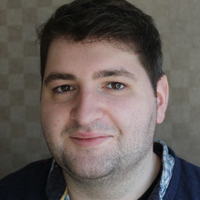 Clips of the documentary that was made about the project feature in this new version, directed by Zoe Lafferty, showing the contributors discussing why they chose to tell their stories through the lens of Euripides’ play. 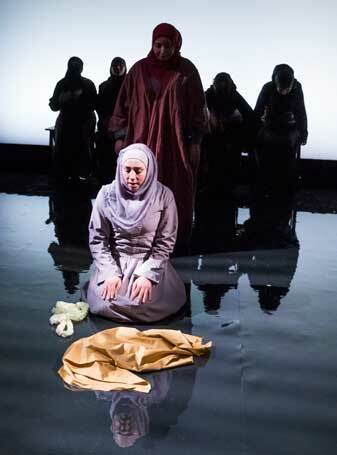 These moments of self-reflection mean that this incarnation, three years after conception, is almost as much about the potency of theatre as a place for telling stories as it is about the stories themselves. 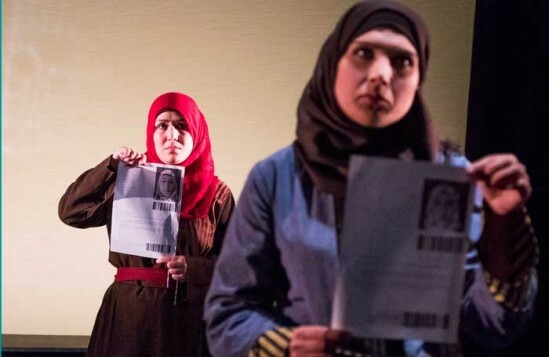 While Queens of Syria is a reclamation of voice and narrative control, it also excels as theatre. The stage is dark most of the time, clean and blank with three benches placed around the edges. 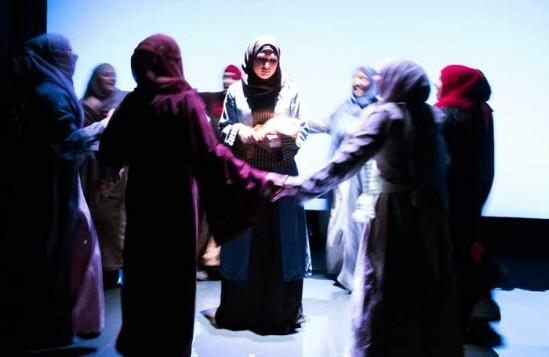 The only colour comes from the performers’ clothes and headscarves. The script is made up of extracts from Euripides’ play as well as letters written by these women to their families, their stories and memories – all directly addressed to the audience and performed with resolve, with anger, and with tears sometimes. Everything else in the production is stripped back. The women’s words sting. They have an icy clarity. But, as the performers direct their words at the audience, they also support and assist each other. They set up each other’s microphones when it’s their turn to speak, and in the darkness on the benches one woman touches another’s leg after she wells up during her monologue. Queens of Syria is about the power of words – stories, testimonies, letters, ancient texts and new ones – any way that these women can tell their stories and have us listen. Really listen. Because words become headlines too easily. They become devoid meaning: refugee, Syria, war. These testimonies find humanity, particularly, in the senses, from the smell of jasmine to the taste of pizza. 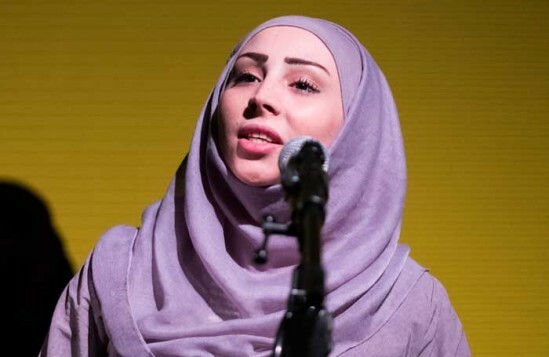 There are some truly devastating moments: one of the women, Sham, actually apologises to her children for not being able to offer them a better life. She apologises. The unconscionable number of those displaced from their homes turns humans into logistics and statistics; these women rip up the travel documents that have huge barcodes under their photos. They re-humanise themselves. And they do it in a theatre, a space where we are asked to listen, and where we can do very little else.